Everyday has a number attached to it. Great additions, subtractions. This is not just an aesthetic problem (see Ashbery). There is a “natural impulse toward the boundedness of closure.” The bell rings, trading stops. But the world is “unfinished” (Hejinian). Both the rivers and their banks are moving. The poem remains incomplete. The trading day long over. Even when we think we are at the end, there are decimals. When the Buddha touched his finger to ground at the moment of enlightenment, all the leaves fell from the Bodhi tree. It is February 10, 10:04 in the morning, the Dow falls to 12194. The present poetic strives toward total awareness, incessant recording. Ravenous as a black walnut tree, roots sucking at the sewer line, the Dow touches everything: the taste of our water, color of our sky, torque of our engines. It is February 10, 10:15 in the morning, the Dow at 12203 is rising. The poet—like the trash tree—uses all of it. A poem moves as does the Dow influenced by a variety of factors and events: mergers, oil spills, revolutions, suffering. Sometimes what does not move tells the story. I like poems that go to prisons and coal mining towns. I like poems that act as archive or a view to Elizabeth Street. I admire circuitry and cosmology. I write with a power industry dictionary on the bookshelf behind my desk, a copy of the King James, a guide to Texas trees. It is February 10, 1:11 in the afternoon, the Dow falls to 12197. The poet wants to remind the Dow that the bird has something to teach it about falling and song. 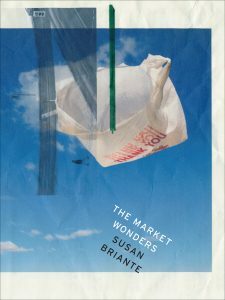 Excerpted from “Towards a Poetics of the Dow” in The Market Wonders © Susan Briante 2016. Published by Ahsahta Press. Reproduced by arrangement with the Publisher & author. All rights reserved.